We started the day with breakfast at Turtle Bay Cafe, and once I had enough caffeine in my bloodstream to engage more than two brain cells at the same time, I reviewed the data on the SD cards from the overnight test runs. They all looked good. Over breakfast we met up with Monika Wnuk, a multimedia journalist and documentary photographer from Northwestern University, who wanted to interview Trish for a water & development story she was working on. Yesterday, when she heard about our abbreviated schedule, she volunteered to help with the sensor preparation, and to provide shore support for our deployment dive. I was glad for the assistance, as two scheduled days were now being merged into one single operation. 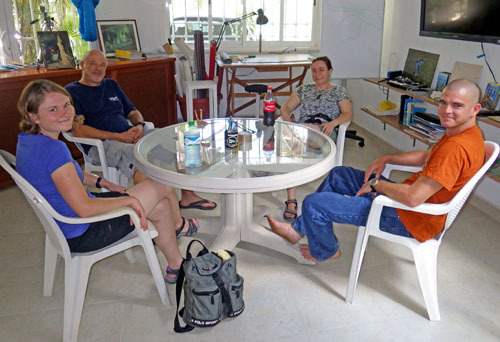 Pre-dive planning with Monica, Bil, Trish & Jeff. Our diving field work almost always begins with a visit to Speleotech in Tulum, to see our long time friend Bil Phillips. 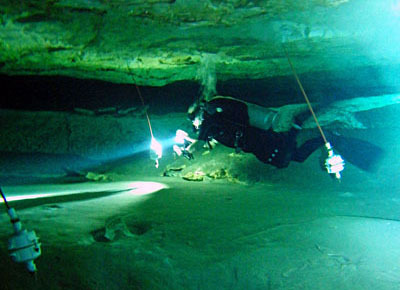 Bil taught me to cave dive many years ago, and I still have much to learn from that remarkable man, who is without doubt one of the most dedicated cave explorers in the world. We also had the good fortune of meeting another good friend, Jeff Clark, who loaned me some equipment I needed for the days dive. 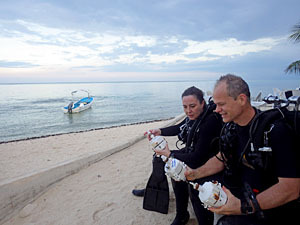 The dive community in Tulum has always been generous to visiting researchers because they understand, more than most people, what is at risk with the rapid development that is happening in the region. We all share a passion for protecting the caves as both a vital water resource, and as areas of natural beauty & wonder. Inspecting the old units for rotation, damage, etc. calibration out of the way, Trish and I set off on the dive. High tide at the coast meant the system was experiencing very low flow, so we had a relaxed swim, with three new pendulums and a pressure sensor stowed neatly in the mesh bag by my side. Once at the site, the first task was to do a general inspection of the old units, noting anything unusual in my dive notebook. After almost five months of submersion, there was plenty of rust on the stainless steel bolts and one of the units needed it’s anchor plate replaced. Using the checklist I had prepared earlier, we swapped each unit in succession with it’s replacement. In the calm conditions, percolation obscured our view a bit as our bubbles meandered around the ceiling of the cave, but it was still a very simple operation to exchange flow sensors. …checking that the new units were secure, with the X axis of the accelerometers oriented toward north. While this is not strictly necessary with magnetometers inside the units, I can use it as a rough confirmation of the compass bearings when I get the chance to do some proper data analysis later. I gathered the old sensors into the mesh bag and we made our way out of the cave. I am not sure I can fully express the excitement that an inventor feels returning from a dive like this, but it’s very, very cool. 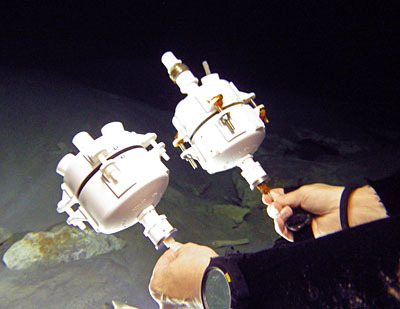 This entry was posted in Developing a FLOW ≋ sensor, DIY UNDERWATER housings, Expedition Reports & Updates, How this project started... on September 18, 2014 by edmallon.